You come to silks on Sundays, but your new-best-friend-to-be does lyra on Thursdays. HOW EVER SHALL YOU TWO SHIPS MEET? Why, at Air Temple’s first-ever SOCIAL NIGHT, of course! Join us for an evening of low-octane hangouts, crafting, board game playing, juggling, movie watching and MORE! Come with your bad self, any age-appropriate beverages or snacks you wish to share or hoard to yourself like a cranky dragon without any friends. Feel free to bring any crafts, coloring books or games you wish to work on or play! Please bring $5 to keep the lights on for future social nights, and some cash if you wish to get in on any pizza-ordering. 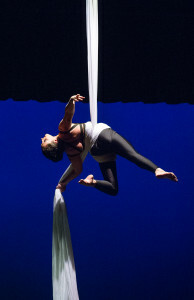 Come explore the challenging but versatile apparatus of Corde Lisse in our intro workshop! We’ll work on rope fundamentals–front and back balances, toe climbs, and more. This workshop will also focus on exploration of creative pathways, conditioning for strength based and dynamic movements, as well as some exercises and games to help you get your ‘rope brain’ working and learning to think outside the aerial box! 2 pull ups, the ability to invert comfortably and repeatedly in the air, clean windmill hip-keys. If you’re not sure you meet the requirements for the class, but are interested, please talk to you instructor. Facebook event here. Register online here. Join us for Air Temple’s Spring Open Stage Night! The Open Stage will take place on May 6th, 2016. We’ll have plenty of squishy things to rest your bottom on as you enjoy the circus stylings of the Air Temple community, but you’re welcome to bring your own. Doors open at 7:45. No food allowed. Do you want to perform someday but need some help getting there? Maybe you’ve already performed but you feel like you’re stuck in a creative quagmire. Either way, boy oh boy do we have the workshops for you! Both workshops are suitable for any apparatus! Are you interested in performing, but have no idea how to go about writing an act? If so, this workshop is for you! In this workshop we’ll discuss tantalizing topics like how to pick music, creating sequencing, transitions, and the laws of conservation of (your) energy. Class will take place on the ground in discussion. Come with a notebook, any ideas you already have, and your creative thinking cap on! In this workshop we will begin working on the principles of character, fluidity and adaptation of choreography to suit one’s strengths as they relate to performing. We will play with performing choreography to different styles of music and explore new ways into old skills. You will explore with set sequences that we will provide for you based on your level and interests. You will also work to create your own short sequence based on your findings in the workshop. Successful completion of level 150 in any apparatus.